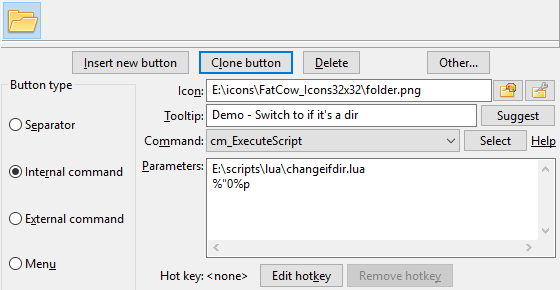 Double Commander can execute Lua scripts via cm_ExecuteScript command. This was introduced with version 0.8 of Double Commander. It is also possible to write content plugins (.wdx) using Lua script. More informations on Lua script programming language are available on the web on this link. In order to interpret Lua script file, we need to have a version 5.1 Lua DLL file in the same folder as the executable of Double Commander or in system folder. By default DC looks for a file with name lua5.1.dll (Windows), liblua5.1.so.0 (Unix or GNU/Linux) or liblua5.1.dylib (Mac OS). We can use DLL file from LuaJIT project. It may require to manually edit the filename in <PathToLibrary> parameter. LuaJIT combines a high-speed interpreter, written in assembler, with a state-of-the-art JIT compiler. Also we get FFI library, which allows calling external C functions and using C data structures from pure Lua code. If we're using a 64-bits version of DC, the dll must be the 64-bits version as well. Generally, the dll will come with DC installation but if for whatever reason it's not there, we may find it under this link or through our packages manager. Double Commander offer a few libraries of functions for our Lua scripts. This library contains Double Commander specific functions. It provides all its functions inside the table DC. Write a message to the log window. Message : The message text. MsgType : The message type: 0 - information, 1 - success, 2 - error. bForce : A boolean, when true, will show the log window if invisible. bLogFile : A boolean, when true, will write the message also in the log file. This allows the script to invoke internal commands of DC. The Command is holding the actual internal command name. We may provide as many Param... as command may support. -- 1. Focus on right panel. -- 2. Close all tabs. -- 3. Switch to a specific directory. -- 4. Focus on left panel. -- 5. Close all tabs. -- 6. Switch to a specific directory. -- 7. Open a new tab. -- 8. Switch to a specific directory. 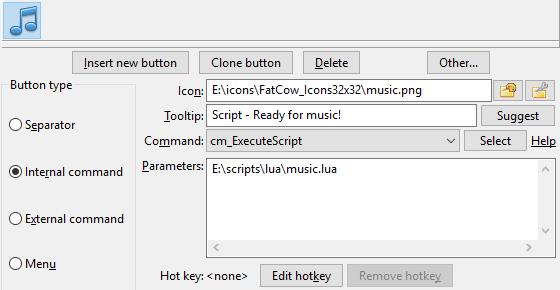 Using the internal command cm_ExecuteScript, we may configure a tool bar button that will execute our script. Also, we may use the internal Double Commander Editor for editing our scripts. This library contains various system functions. It provides all its functions inside the table SysUtils. Suspends the execution of the script for the specified number of Milliseconds. After the specified period has expired, script execution resumes. Returns an increasing clock tick count. It is useful for time measurements, but no assumtions should be made as to the interval between the ticks. Check whether a particular file exists in the filesystem. Returns in bFlagExists the value true if file with name FileName exists on the disk, or false otherwise. Checks whether Directory exists in the filesystem and is actually a directory. If this is the case, the function returns in bFlagExists the value true otherwise false is returned. Returns in Attr the attribute settings of file FileName. See the detail explanations of the returned value here. Looks for files that match the Path, generally with wildcards. If no file is found, Handle will be nil. When at least one item is found, the returned Handle may be used in subsequent SysUtils.FindNext to find other occurences of the same pattern. The FindData table contains information about the file or directory found. Name : The file name (without path). Attr : The file attributes of the file (see details here). Size : The size of the file in bytes. Finds the next occurrence of a search sequence initiated by FindFirst by re-using the Handle returned previously. Returned Result will be non-nil if a file or directory is found and will be nil otherwise. The same notes mentionned for SysUtils.FindFirst applied here. Remark: The last SysUtils.FindNext call must always be followed by a SysUtils.FindClose call with the same Handle. Failure to do so will result in memory loss. Ends a series of SysUtils.FindFirst/SysUtils.FindNext calls. Frees any memory used by these calls. It is absolutely necessary to do this call, or memory losses may occur. Allows a script to get from DC the system path delimiter. In Unix/Linux system will be a " / " and in Windows will be " \ "
FileGetAttr returns the attribute settings of file FileName. In Unix/Linux, this means that the filename starts with a dot. The file is a system file. In Unix/Linux, this means that the file is a character, block or FIFO file. Only for DOS/Windows on a plain FAT (not VFAT or Fat32) filesystem. File is a symbolic link. Note: In case of error, -1 is returned. See an example in the next section. This following script is an example of usage of the SysUtils.FileGetAttr. When the parameter is detected to be a directory, it will open a new tab in the active panel and switch to it. if #params == 1 then -- We got at least one parameter? if myfileattr > 0 then -- We got a valid attribut? -- bit 4 is set? So it's a directory. In the above example, the param is the 1st parameter passed to the script. When using the internal command cm_ExecuteScript, it will will be the first parameter passed after the script filename. In this example, the parameter %"0%p will be passed to the script. This will represent, unquoted, the filename of the item currently selected in the active panel at the moment we press the toolbar button. In the following script example, we'll scan the content of the directory we received in parameter and store resulting data into a text file with the filename passed as a second parameter. This will give us a good idea of the usage of FindFirst, FindNext and FindClose. if #params == 2 then -- We got our 2 parameters? So it's easy to configure a toolbar button using the internal command cm_ExecuteScript and pass the parameter to accomplish all this. In this example, the parameter %"0%Ds will be passed to the script as the first parameter. This will represent, unquoted, the directory displayed by the active panel. 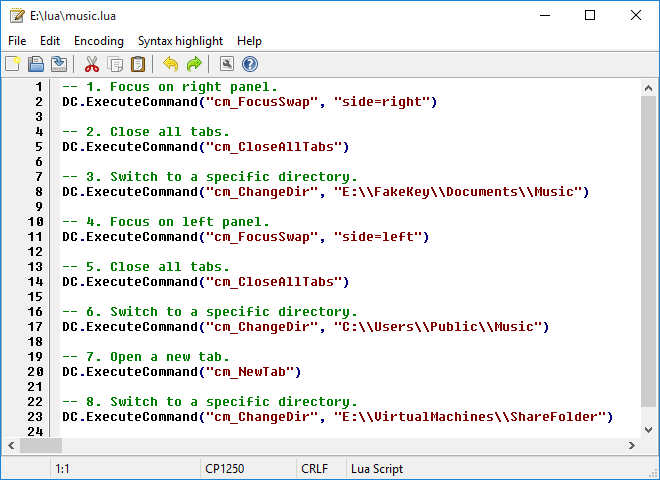 Double Commander may provide external clipboard functionality to our Lua scripts. Clear the content of the clipboard. Get the current text content of the clipboard to assigned it to StringVar. Store in the clipboard the text content of StringVar. Adds html-formatted text Html to the clipboard (CF_HTML clipboard format). This contents will be inserted in applications which support this clipboard format, like MS Word, LO Writer, etc. It's correct to store data with both Clipbrd.SetAsText and Clipbrd.SetAsHtml. When we'll paste, the application will use the best one that it supports. If we switch to Notepad attempting to paste something, it will paste in plain text the message we copied with Clipbrd.SetAsText. But if we switch to Microsoft Word and paste something, it will paste the second one, the one with Double Commander in bold since the Microsoft Word recognize and support that clipboard content type. The following example is using three functions related with the clipboard: Clear, GetAsText and SetAsText. It's a relative long script but it's good to put together a few functions we've seen above. It assumes our active panel is currently into a directory with many source text files. It also assumes we currently have in clipboard a single word and that it will receive as a single parameter the current active folder. The script will scan the file in that current level of directory and will read the content of them one by one to detect text line that containts the word that was in clipboard. Then, the filenames of the files that containt at least one line with that word will be place into the clipboard. Then, the script will use the internal command cm_LoadSelectionFromClip and the files that have the words will then be selected. Also, at the end, we put back in our clipboard the original word that needed to be searched. if #params == 1 then -- We got our parameter? sSearchString = Clipbrd.GetAsText() -- Get the expression to search. Clipbrd.Clear() -- Making sure we have nothing in clipboard. DC.ExecuteCommand("cm_MarkUnmarkAll") -- Make sure nothing is selected. -- Let's scan one by one all the files of our directory. -- We need file, not directory! -- Let's now read the file line by line until the the end OR a found. sFileToSelect = sFileToSelect .. FindData.Name .. "\n"
-- If we've found something, select it! Clipbrd.SetAsText(sSearchString) -- Restoring what we had in clipboard. This library allows our scripts to interact with user to display message, prompt for answers, etc. Will diplay a message box prompting a user to click a button which will be returned by the function. Message : The message inside the box. Title : The text displayed as the title of the box. ButFlags : OR'ed value of constants to determine the buttons that will be displayed, the style of window and default button selected for the answer. See the following table the buttons displayed, style of window or default button. ButPressed : Returned value indicating the button user pressed (see this table). Will display a requester box where user may enter a string value. Msg : The message inside the box. bMask : A boolean, when true, will display "stars" to hide characters. sDefault : The default suggested text that user may type over if necessary. bAck : Returned boolean indicating if user effectively enter something or not. sAnswer : Returned string when user entered something and then clicked ok. Displays a dialog box to allow the user to choose from a list of items. Title : The text displayed as the title of the dialog. Msg : The message inside the dialog. Items : A Lua table, each element of the table must be a string. sDefault : The default selected item in the list. sAnswer : Returned the selected item as a string or nil if the dialog is dismissed. Note: If we press the "x" in top right or press Esc to close the window, then the value of the button "Cancel" is will returned. This library provides basic support for UTF-8 encoding. It provides all its functions inside the table LazUtf8. Search for substring in a string, starting at a certain position. The search is case-sensitive. Returns the position of the first occurrence of the substring SearchText in the string SourceText, starting the search at position Offset (default 1). If SearchText does not occur in SourceText after the given Offset, zero is returned. Copy returns a string which is a copy if the Count characters in Source, starting at position Index. If Count is larger than the length of the string Source, the result is truncated. If Index is larger than the length of the string Source, then an empty string is returned. Returns the number of UTF-8 characters in the string. Receives a string and returns a copy of this string with all lowercase letters changed to uppercase. Convert String encoding from FromEnc to ToEnc. Default system encoding (depends on user locale): "default". Default ANSI (Windows) encoding (depends on user locale): "ansi". Default OEM (DOS) encoding (depends on user locale): "oem". Unicode: "utf8", "utf8bom", "ucs2le", "ucs2be". ANSI (Windows): "cp1250", "cp1251", "cp1252", "cp1253", "cp1254", "cp1255", "cp1256", "cp1257", "cp1258". OEM (DOS): "cp437", "cp850", "cp852", "cp866", "cp874", "cp932", "cp936", "cp949", "cp950". ISO 8859: "iso88591", "iso88592", "iso885915". The meaning of special encodings (examples). This library contains functions related with the operating system where Double Commander is running. Will execute command as it would be typed on the command-line and return the result code of the operation. Will return a filename to use as a temporary filename. Will delete the file or the directory with the name filename. If it works, function returns true. Will rename the file nameS with the new name nameD. Will return the value of the variable variablename passed in parameter. If no variable of that name exists, it will return nil.